And it's a good thing too, otherwise I'd likely see a gain this week. We had little Myra's first ever birthday party on Sunday and it was a blast! We had SO MUCH fun with all our friends. The only thing about those parties is you never get enough time to talk to everyone. But I had plenty of time to eat cake! My mom got the cake and it was way too good. Seriously, it was good. And I ate a lot of it. Too much. I won't even tell you how many bites and slices I ate on Sunday and yesterday - but I gave away the last leftovers last night so thank goodness it's gone or I'd probably be standing at the refrigerator right now with a fork. And I didn't let 35 pounds of extra fat stop me from getting in the pool with my babies. I had a blast playing with Marek in the too-fun kids pool and then spent some time laughing it up with Myra in the water too. The kids had a great time, seeing their smiles and hearing them laugh was the best part of the day. 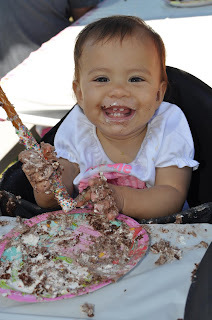 Myra massacred her cake and also went to town on one of the chocolate dipped pretzels I made. I started out the holiday weekend telling myself that I was in control of everything that went in my mouth. Too bad that didn't translate into a little more self-restraint but oh well, what's done is done. Time to move on. And I am. I didn't go to the gym on Saturday or Sunday, planned days off. But I did yesterday and wow! What a difference the time off made. I did Week 6/Day 1 on the treadmill and I am certain I could have run 25 minutes without a hitch. It just felt so easy. I know from experience that once I start tallying up the gym days it won't stay easy but it sure was a nice break from the tough running sessions. I did chest and triceps and core work followed by 5 minutes on the stair climber. The stair climber is getting a bit too easy so I upped the pace to 43 steps per minute. I think I was doing 41. That's probably a barely noticeable increase but since this is done after my whole workout I don't want to get too crazy. Closed out with a nice stretching session and left feeling ready to face the world. I had this whole scheme to eat only fruit on Monday to cleanse from all that cake. Didn't happen. I ate more cake, some chips...you get the idea. Like I said, good thing the party is over and the cake is gone. Today I have a fun day planned. I am off work today (I planned it because I figured I'd need to recover from the party) and I'm using my last massage gift card at Sonoma Mission Inn. I'm headed to the gym now and then there to relax, rejuvenate, renew, re-evertyhing. I need to be extra aware with the food intake the rest of this week but I'm feeling very motivated by my 189.4 weight. I don't want to go back into the 190's and I would like to lose the .4 and pass the 10 pounds lost mark. Let's hope I can pull it off!! p.s. there was THE FITTEST super hot woman at the gym yesterday that I have possibly ever seen outside of a magazine. She must be a fitness model or a competitor or something. This woman would need NO airbrushing for her cover of Shape. Her waist was like barbie's (as were her breasts) and while she was tiny, every muscle showed, including all her abs. And she had full makeup on! She worked out in an sports bra and skin tight workout pants and man, I had a hard time not staring at her. If she's there again I might just have to talk with her. I am dying to know what she does with that body (i.e. modeling or competing or what). /p.s. I'm so happy to see Myra so happy..and to hear you rejoicing in your life. Love you girls!